Joshua 19:8 and all the villages that were around these cities to Baalath Beer, Ramah of the South. This is the inheritance of the tribe of the children of Simeon according to their families. Judges 4:5 She lived under the palm tree of Deborah between Ramah and Bethel in the hill country of Ephraim: and the children of Israel came up to her for judgment. Judges 19:13 He said to his servant, "Come and let us draw near to one of these places; and we will lodge in Gibeah, or in Ramah." 1 Kings 15:17 Baasha king of Israel went up against Judah, and built Ramah, that he might not allow anyone to go out or come in to Asa king of Judah. 1 Kings 15:21 It happened, when Baasha heard of it, that he left off building Ramah, and lived in Tirzah. 1 Kings 15:22 Then king Asa made a proclamation to all Judah; none was exempted: and they carried away the stones of Ramah, and its timber, with which Baasha had built; and king Asa built therewith Geba of Benjamin, and Mizpah. 2 Chronicles 16:1 In the six and thirtieth year of the reign of Asa, Baasha king of Israel went up against Judah, and built Ramah, that he might not allow anyone to go out or come in to Asa king of Judah. 2 Chronicles 16:5 It happened, when Baasha heard of it, that he left off building Ramah, and let his work cease. 2 Chronicles 16:6 Then Asa the king took all Judah; and they carried away the stones of Ramah, and its timber, with which Baasha had built; and he built therewith Geba and Mizpah. Ezra 2:26 The children of Ramah and Geba, six hundred twenty-one. Nehemiah 7:30 The men of Ramah and Geba, six hundred twenty-one. Isaiah 10:29 They have gone over the pass. They have taken up their lodging at Geba. Ramah trembles. Gibeah of Saul has fled. Jeremiah 31:15 Thus says Yahweh: A voice is heard in Ramah, lamentation, and bitter weeping, Rachel weeping for her children; she refuses to be comforted for her children, because they are no more. Jeremiah 40:1 The word which came to Jeremiah from Yahweh, after that Nebuzaradan the captain of the guard had let him go from Ramah, when he had taken him being bound in chains among all the captives of Jerusalem and Judah, who were carried away captive to Babylon. Hosea 5:8 "Blow the cornet in Gibeah, and the trumpet in Ramah! Sound a battle cry at Beth Aven, behind you, Benjamin! Matthew 2:18 "A voice was heard in Ramah, lamentation, weeping and great mourning, Rachel weeping for her children; she wouldn't be comforted, because they are no more." ra'-ma (ha-ramah, without the definite article only in Nehemiah 11:33 Jeremiah 31:15): The name denotes height, from root rum, "to be high," and the towns to which it applied seem all to have stood on elevated sites. (1) Codex Vaticanus Arael; Codex Alexandrinus Rhama: A fenced city in the lot assigned to Naphtali (Joshua 19:36). Only in this passage is the place referred to. It is probably identical with the modern er-Rameh, a large Christian village on the highway from Cafed to the coast, about 8 miles West-Southwest of that city. To the North rises the mountain range which forms the southern boundary of Upper Galilee. In the valley to the South there is much rich land cultivated by the villagers. The olives grown here are very fine, and fruitful vineyards cover many of the surrounding slopes. No remains of antiquity are to be seen above ground; but the site is one likely to have been occupied in ancient times. (2) Rhama: A city that is mentioned only once, on the boundary of Asher (Joshua 19:29). The line of the boundary cannot be followed with certainty; but perhaps we may identify Ramah with the modern Ramiyeh, a village situated on a hill which rises in the midst of a hollow, some 13 miles Southeast of Tyre, and 12 miles East of the Ladder of Tyre. To the Southwest is a marshy lake which dries up in summer. Traces of antiquity are found in the cisterns, a large reservoir and many sarcophagi. To the West is the high hill Belat, with ancient ruins, and remains of a temple of which several columns are still in situ. (3) Codex Vaticanus Rhama; Codex Alexandrinus Iama, and other forms: A city in the territory of Benjamin named between Gibeon and Beeroth (Joshua 18:25). The Levite thought of it as a possible resting-place for himself and his concubine on their northward journey (Judges 19:13). The palm tree of Deborah was between this and Bethel (Judges 4:5). Baasha, king of Samaria, sought to fortify Ramah against Asa, king of Judah. The latter frustrated the attempt, and carried off the materials which Bassha had collected, and with them fortified against him Geba of Benjamin and Mizpah (1 Kings 15:17 2 Chronicles 16:5). Here the captain of Nebuchadnezzar's guard released Jeremiah after he had been carried in bonds from Jerusalem (Jeremiah 40:1). It figures in Isaiah's picture of the Assyrians' approach (Isaiah 10:29). It is named by Hosea in connection with Gibeah (5:8), and is mentioned as being reoccupied after the exile (Ezra 2:26 Nehemiah 7:30). It was near the traditional tomb of Rachel (Jeremiah 31:15; compare 1 Samuel 10:2 Matthew 2:18, the King James Version "Rama"). (4) Aramathaim: The home of Elkanah and Hannah, and the birthplace of Samuel (1 Samuel 1:19; 1 Samuel 2:11, etc.). In 1 Samuel 1:1 it is called "Ramathaim-zophim" (ha-ramathayim-tsophim). The phrase as it stands is grammatically incorrect, and suggests tampering with the text. It might possibly be translated "Ramathaim of the Zuphites." It was in Mt. Ephraim, within accessible distance of Shiloh, whither Samuel's parents went up from year to year to worship and to sacrifice (1:3). From Ramah as a center Samuel went on circuit annually, to judge Israel, to Bethel, Gilgal and Mizpah (7:16). It is very probable that this is the city in which, guided by his servant, Saul first made the acquaintance of Samuel (9:6, 10), where there was a high place (9:12). Hither at all events came the elders of Israel with their demand that a king should be set over them (8:4). After his final break with Saul, Samuel retired in sorrow to Ramah (15:34). Here, in Naioth, David found asylum with Samuel from the mad king (19:18, etc. ), and hence, he fled on his ill-starred visit to Nob (20:1). In his native city the dust of the dead Samuel was laid (25:1; 28:3). In 1 Maccabees 11:34 it is named as one of the three toparchies along with Aphaerema and Lydda, which were added to Judea from the country of Samaria in 145 B.C. Eusebius, Onomasticon places it near Diospolis (Euseb.) in the district of Timnah (Jerome). There are two serious rivals for the honor of representing the ancient Ramah. (a) Beit Rima, a village occupying a height 13 miles East-Northeast of Lydda (Diospolis), 12 miles West of Shiloh, and about the same distance Northwest of Bethel. This identification has the support of G. A. Smith (Historical Geography of the Holy Land, 254), and Buhl (Geographic des Alten Palestina, 170). (b) Ramallah, a large and prosperous village occupying a lofty position with ancient remains. It commands a wide prospect, especially to the West. It lies about 8 miles North of Jerusalem, 3 West of Bethel, and 12 Southwest of Shiloh. The name meaning "the height" or "high place of God" may be reminiscent of the high place in the city where Saul found Samuel. In other respects it agrees very well with the Biblical data. (5) Ramah of the South, the King James Version "Ramath of the South": Ramath is the construct form of Ramah (Joshua 19:8) (ra'math neghebh; Bameth kata liba). A city in that part of the territory of Judah which was allotted to Simeon. It stands here in apposition to Baalath-beer, and is probably a second name for the same place. It seems to correspond also with "Ramoth (plural) of the South" (1 Samuel 30:27), a place to which David sent a share of the spoil taken from the Amalekites. In this passage Septuagint retains the singular form, Rhama notou. Identification has been suggested with Qubbet el-Baul, about 37 miles South of Hebron; and with Kurnub a little farther South. There is no substantial ground for either identification. (6) Codex Vaticanus Rhemmoth; Codex Alexandrinus Rhamoth: Ramah in 2 Kings 8:29 2 Chronicles 22:6, is a contraction of Ramoth-gilead. 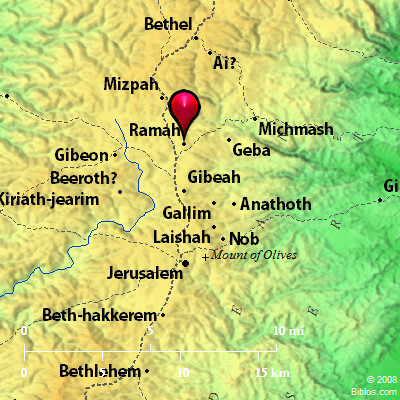 RAMAH, heights now er Ram, 5 ms. n. of Jerusalem; a little village with few ruins. Josh. 18:25, Judg. 4:5, etc. Ramah, a city North of Jer.